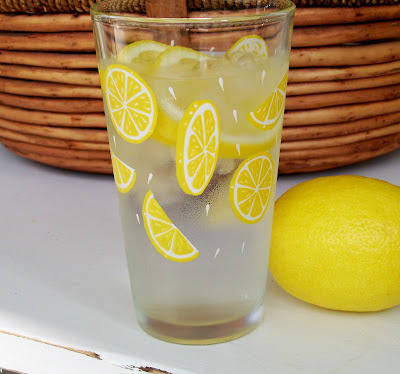 Summer is all about fun and relaxation and what could be more relaxing than enjoying an ice cold drink in these cute little glasses. I came across these today and thought they were so adorable and fun that I just had to share. Bet you'll never guess where I purchased them.....The Dollar Tree! Really! You can find some great things at the place if you look and for a buck each, I wasn't going to pass them by. These will be the perfect fit for a cold glass of iced tea or freshly squeezed lemonade this summer! I just love a bargain! 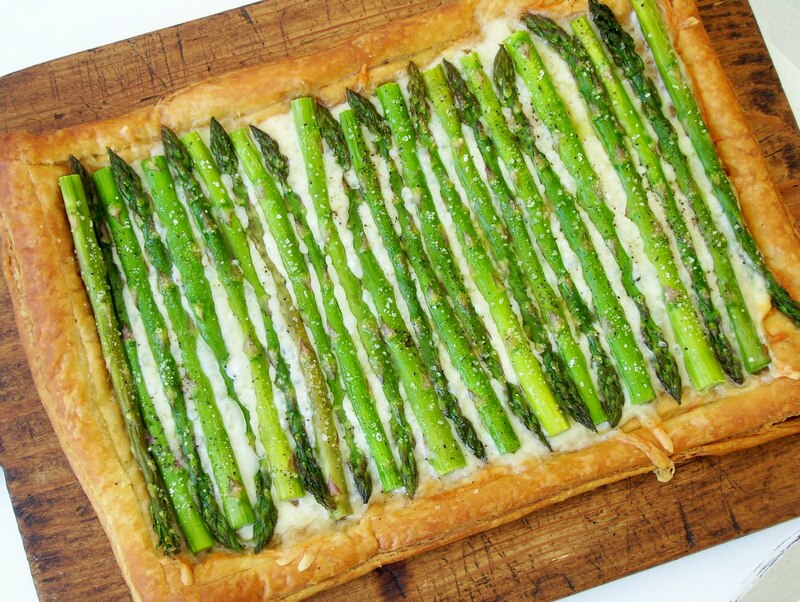 A favorite vegetable around our home is asparagus. I impatiently anxiously wait all winter long for the spring season, when it's flavor is at it's peak, then start buying loads of it at the grocery store to include in my cooking. I thought this tart would make a lovely lunch today. Buttery puff pastry topped with gruyere cheese and tender asparagus, mmmmm. 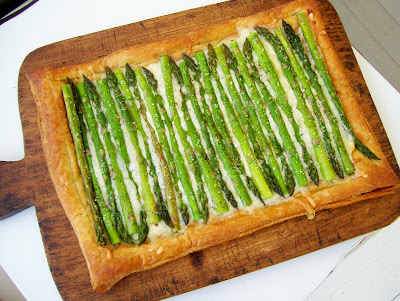 It's really easy to make and the taste was simply wonderful. You can find the recipe here. Happy Spring! Who doesn't love cupcakes? My kids absolutely adore them. 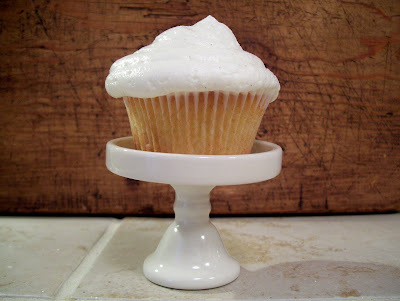 A few weeks ago, I came across these cute little ceramic cupcake pedastals. Aren't they lovely? I think so and just had to have them. For me, part of the fun of baking, besides the happy faces of my family and friends, is a special dish to serve it on. You can order a set by clicking here. My kids are huge fans of vanilla, so I made vanilla cupcakes, of course, but I made them a little extra special by adding vanilla bean. I have a jar stocked full of them for times such as these and like to add them to all kinds of baked goods. Here's a tip, order your vanilla beans on Ebay. They have some wonderful vanilla bean sources there, you get them in bulk and it is so much cheaper than the two you get for around ten bucks at the grocery store. When you are finished scraping the seeds from the vanilla bean, store the pods in your canister of sugar and after a few days, you will have vanilla sugar to use in all your baked goods. These cupcakes were disappearing while I was trying to take photos of them. They are so wonderful and creamy and don't you just love the little stand?! Such a fun, stylish way to enjoy a delicious treat! Enjoy! Preheat oven to 350 degrees and line two 12-cup muffin tins with cupcake papers. In a small bowl, combine the flours and set aside. In a large bowl, cream the butter until smooth. Add the sugar, and pulp of vanilla bean if using, gradually and beat until fluffy, about 3 minutes. Add the eggs, one at a time, beating well after each addition. Add the dry ingredients in three parts, alternating with the milk and vanilla. 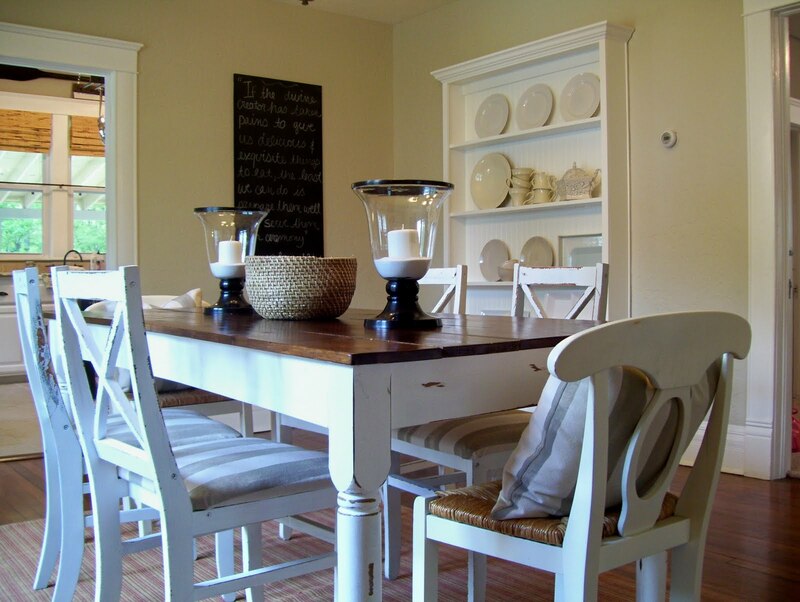 With each addition, beat until the ingredients are incorporated, but do not overbeat. Using a rubber spatula, scrape down the batter in the bowl to make sure the ingredients are well blended. Carefully spoon the batter into the cupcake liners, filling them about three-quarters full. Bake for 20-25 minutes, or until a toothpick inserted in the center comes out clean. 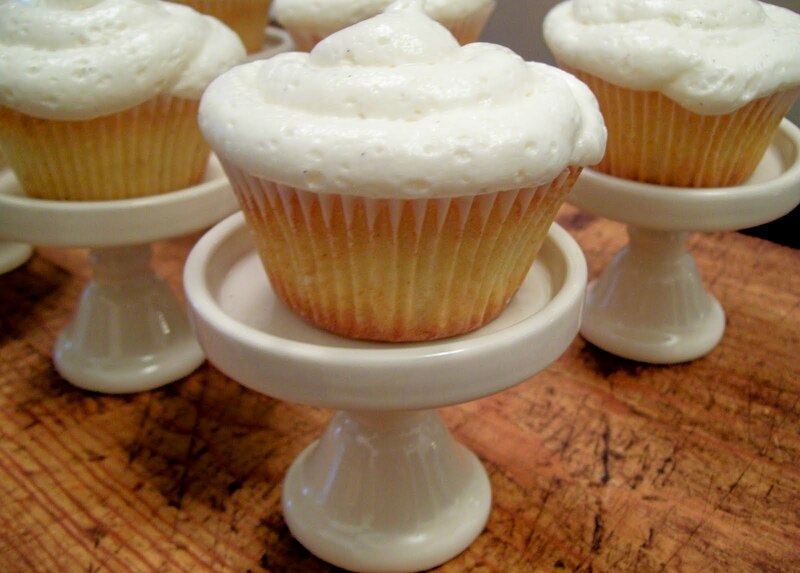 After cupcakes have cooled, frost with vanilla bean buttercream frosting. Cream the butter in a large mixing bowl. Add 4 cups of the sugar, milk, vanilla and pulp from the vanilla bean*. Beat until smooth and creamy, about 3-5 minutes. Gradually add remaining sugar, 1 cup at a time, beating well after each addition (about 2 minutes), until the icing is thick enough to be of good spreading consistency. You may not need all the sugar. Icing can be stored at room temperature in an airtight container for up to three days. *Note: to get the pulp from a vanilla bean pod, slice it down the middle with a paring knife, open it and using the blade of the knife, scrape down the inside of the pod, from top to bottom, gathering up all that wonderful pulp. Don't discard the pod, stick it in your sugar canister and it will turn your regular sugar into something special. Ahhhh, color! I love it when the earth starts waking up again. 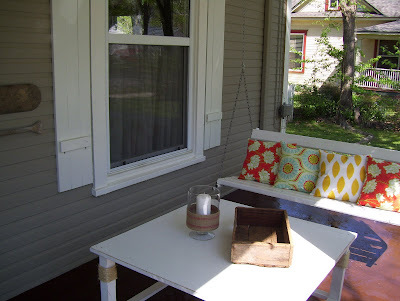 Here is our favorite corner of the porch. There is nothing like relaxing on the porch swing with the people I love. I ordered all the fabrics for the pillows here and made them myself. 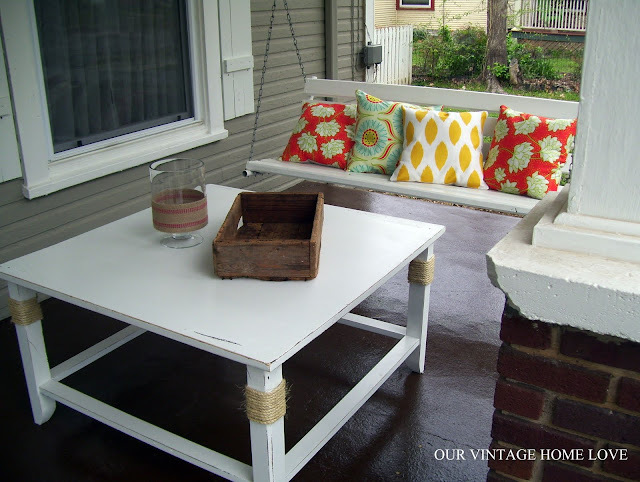 Notice my fun thift store table here in front of the porch swing. Love it! Another view...lots of shadows here, it was very sunny! 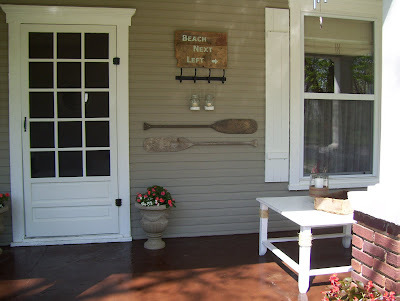 I scraped the old paint off the porch and repainted with an oil based porch paint called Brownstone, purchased at Lowe's. 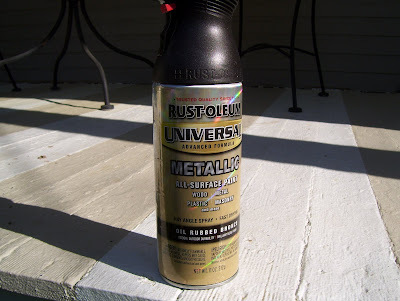 It looked like a can of melted chocolate and was very distracting, yum! I love the glossy shine it gives the porch. I also thought it would contrast nicely with the lighter colors of the house and shutters, which I also repainted a creamy white. 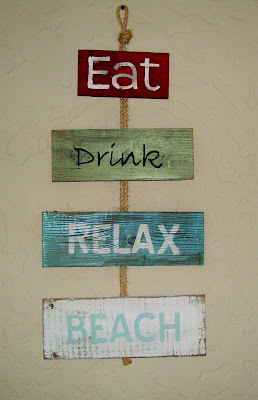 I made the "beach" sign with weathered wood my hubby found in an old barn and light aqua paint I already had. 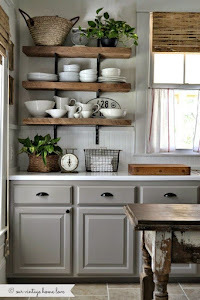 The old oars were also found by hubby in the same barn and the hanging mason jar candle holders were purchased at Pottery Barn last summer. I love the beachy, comfy feel it all gives the front porch. 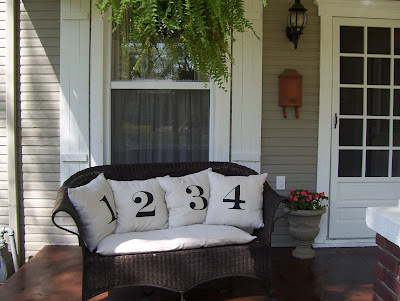 Moving on to other side of the porch....After seeing these numbered pillows in a Pottery Barn catalog, I decided to make them myself by printing the numbers off the computer, creating a stencil with freezer paper and painting the numbers on the fabric. Fun and free! I adore these pillows! You just can't have too many of them when cuddling up with your hubby or kiddos on a relaxing spring or summer evening. Next up, the side porch.....looking at this porch makes me so happy! The floor was the same boring color as the front porch so I scraped, sanded and removed most of the paint. I wanted to do something fun here so I decided on stripes. What is more fun than that?! First, I painted the entire porch with plain white porch paint purchased at Lowes. 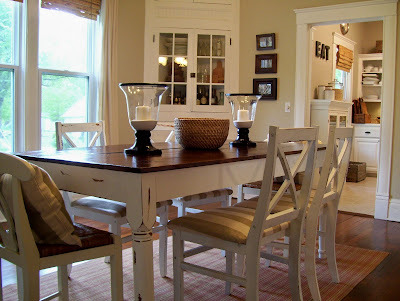 Then, after it completely dried, marked off three planks at a time with painter's tape and painted each alternating group of planks with Benjamin Moore Manchester Tan that I already had. 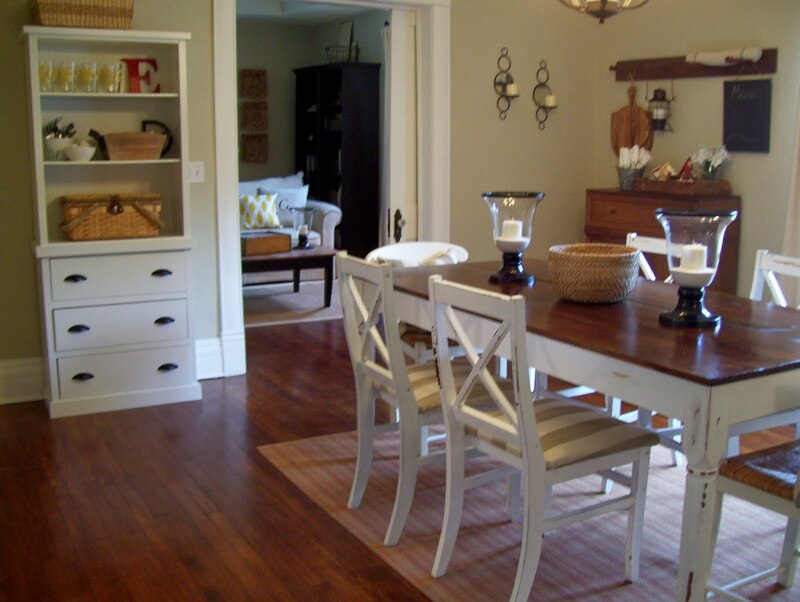 To protect it, I put several coats of non-yellowing floor polyurethane. We love it! 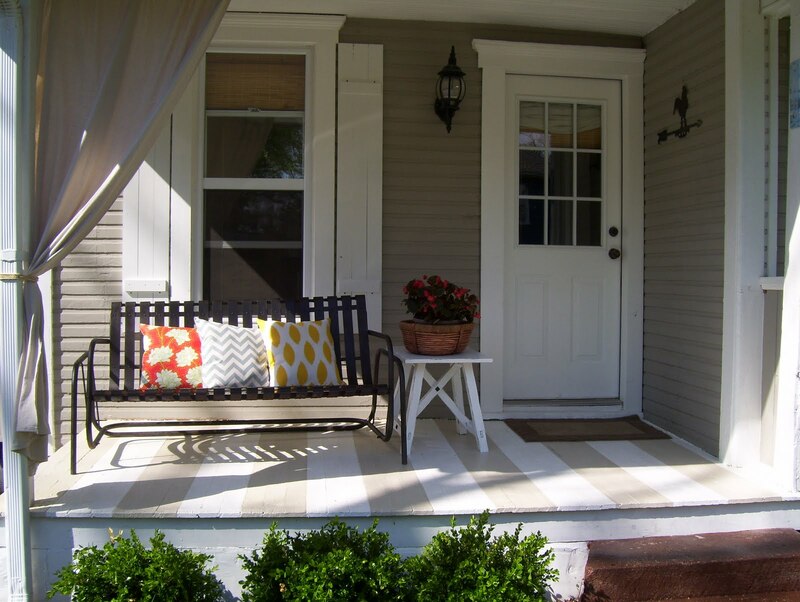 Something fun and unexpected for a porch! 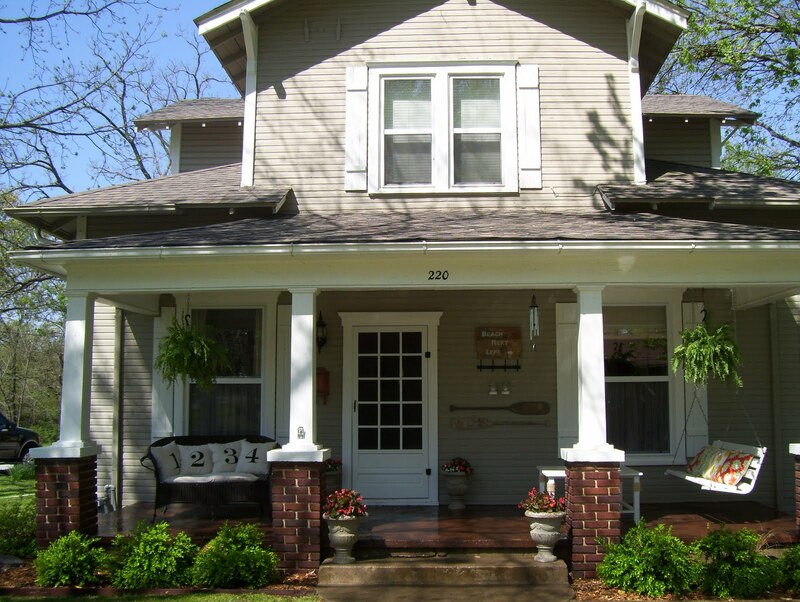 Working on both of these porches has been a lot of fun and the best part was that I hardly spent any money doing it! 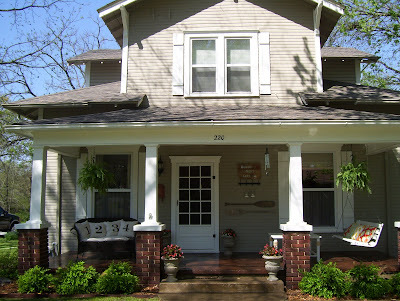 I think they both turned out lovely and all the hard work has made spending time on the porch with my family much more cozy and comfortable. I hope you enjoy looking at the photos as much I enjoyed making over the space! Thanks for looking, have a wonderful day! 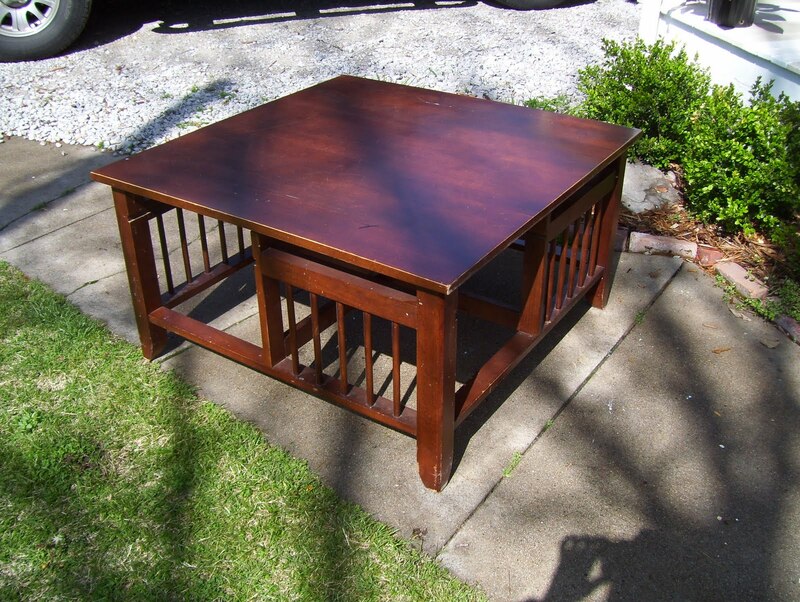 My hubby is terrific at finding things that have great potential and bringing them home to me to turn into something special. It always excites me when he walks in the door and asks me to come take a look at the treasures he's brought home. 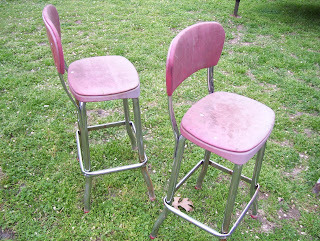 A few days ago, he came home with these two barstools that he found on the side of the road. 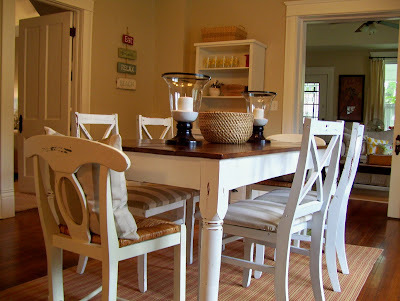 Now, I was jumping for joy over this because I had been trying to find the perfect barstool for our rustic center table/island in the kitchen for quite some time but didn't want to spend much money. 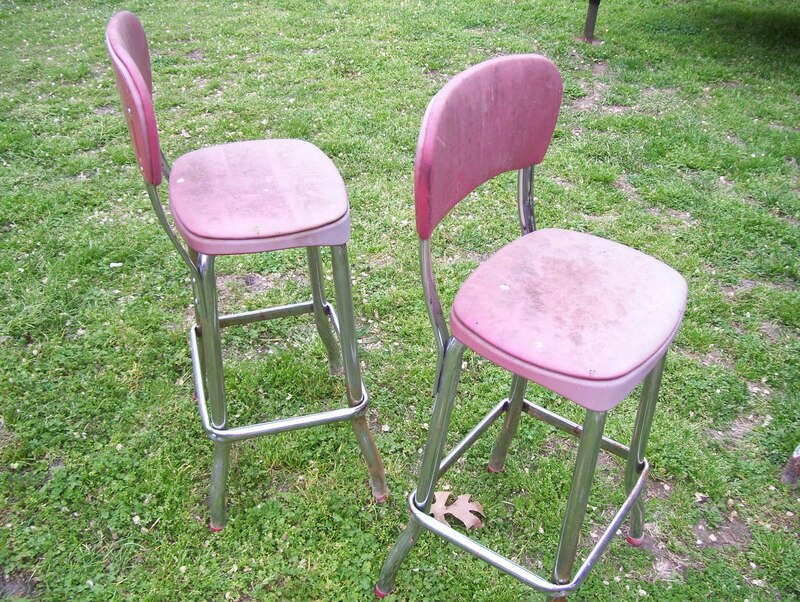 They were in great condition with only a little rust and faded seat covers so I got busy with a little steel wool and went to work, removing all the rust from the legs of the stools. I couldn't decide what I wanted to do with the seat and back of the stool but after sitting and staring at them for a good while, it came to me.....faux vintage grain sack slipcover! 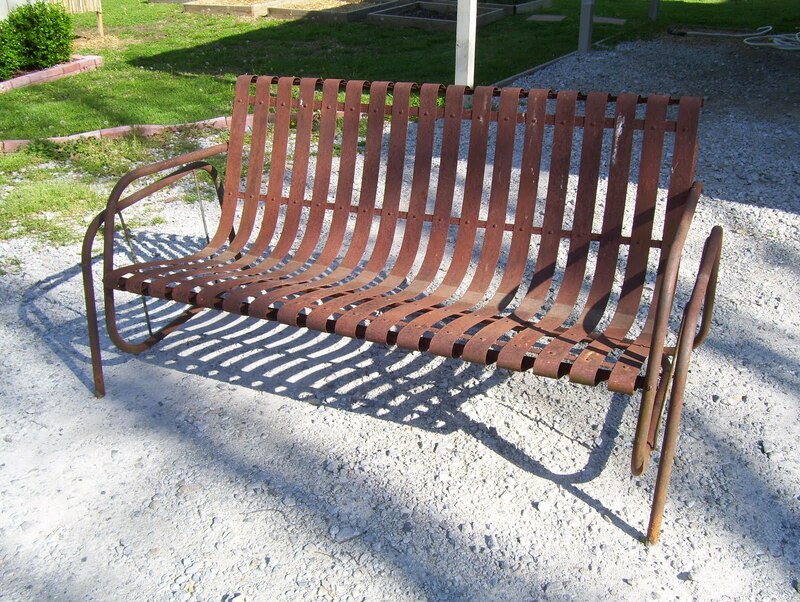 After I finished sanding off the rust with the steel wool, I gave the stools a good bath and removed the backs. 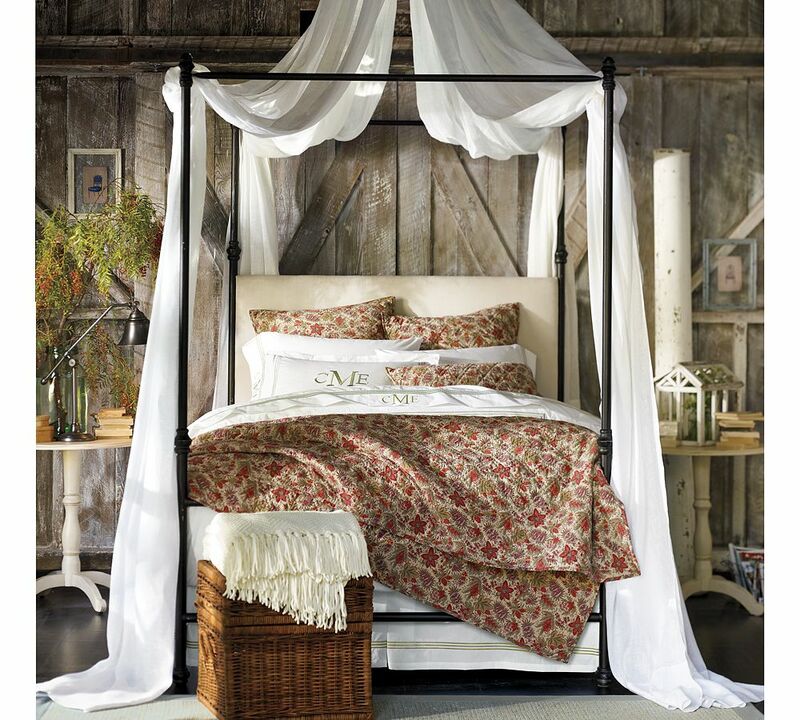 I picked up a package of my favorite "go to" fabric for pretty much everything, painter's canvas drop cloth at Lowe's. 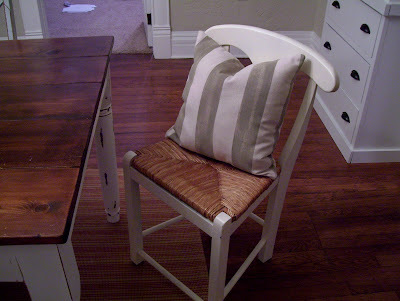 I measured, pieced and pinned my fabric together for the slipcover and sewed together. 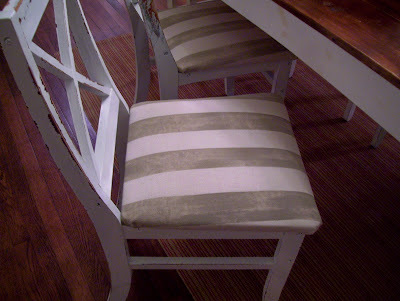 To achieve the stripes on the slipcover, I simply taped off my fabric by placing 1/4 inch quilters tape, or masking tape will work just fine, to the area and using a cotton ball, lightly applied barn red fabric paint to the taped area. 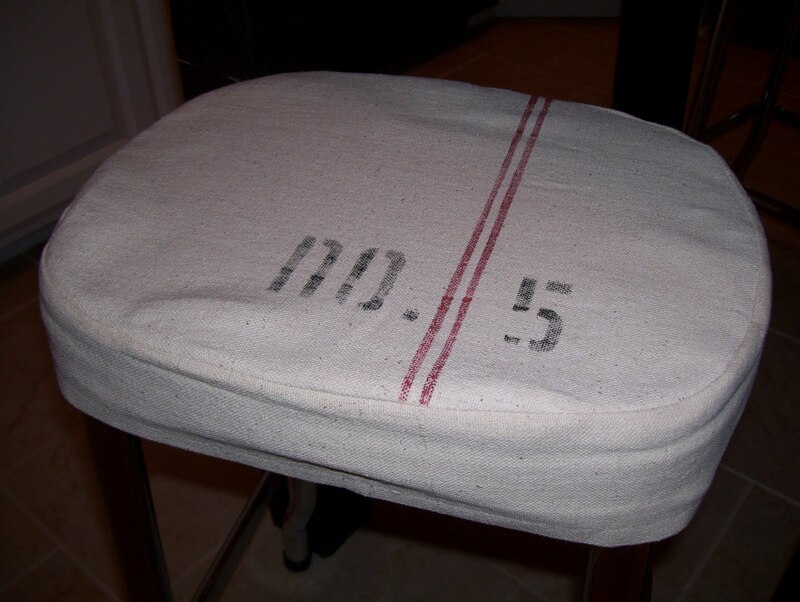 I lightly applied the paint because I wanted it to appear faded or aged like real vintage grain sack cloth. 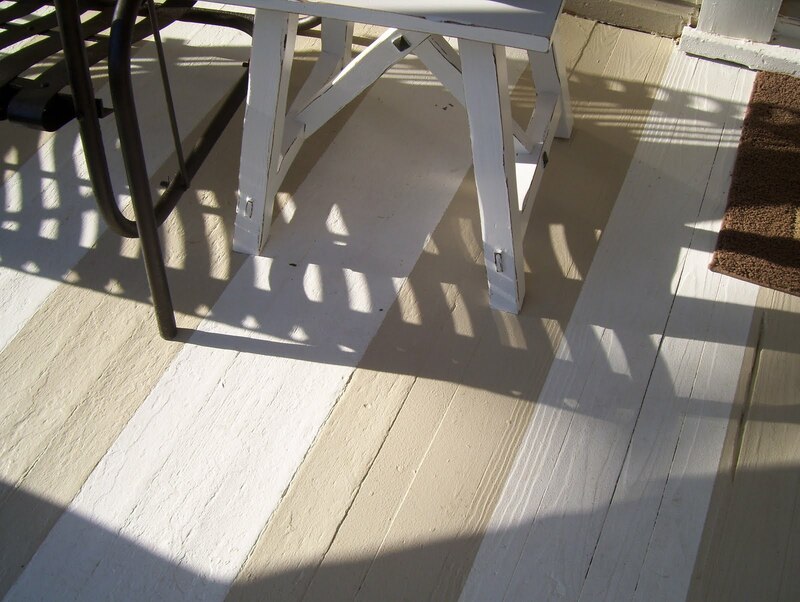 Then I just lifted the tape and voila, perfect stripes. I really do need to remember to take photos of the process. Anyway, for the number stencil, I chose the font Weltron Urban from the Word program on my computer, typed No. 5 and No. 3 (my two favorite numbers), enlarged it to 150 and printed it out. I then taped the printout to the dull side of a piece of regular ol' freezer paper from the grocery store and cut both out to create a stencil. 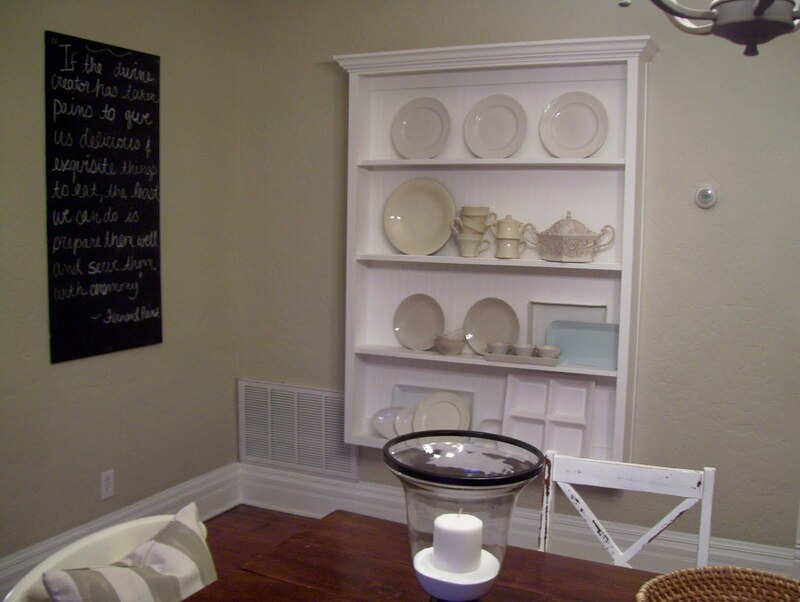 Discard the printout when finished cutting. Next, I placed the freezer paper stencil, shiny side down, where I wanted it on the fabric and ironed it on. Then taking black fabric paint, I dabbed it on the area with a cotton ball, very lightly, and then removed the freezer paper. And there you have it. 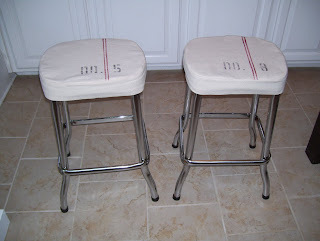 I am in love with these stools and best thing, they were free! Gotta love that! 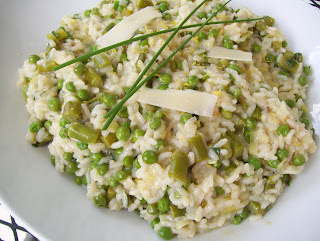 Spring has finally sprung and to celebrate it's arrival (finally), I couldn't think of better dish to prepare, or share, than Spring Green Risotto. Loaded with asparagus, leeks, sweet baby peas, chives and fennel, it really is a wonderful dish to enjoy with family on a lovely spring afternoon. Happy Spring! I'm currently in the middle of a front porch remodel and since our front porch is very large with a porch swing, I wanted to have a square coffee table to place in front of the swing to hold our glasses of fresh squeezed lemonade, a picnic lunch or to kick up our feet and enjoy the summer breeze. 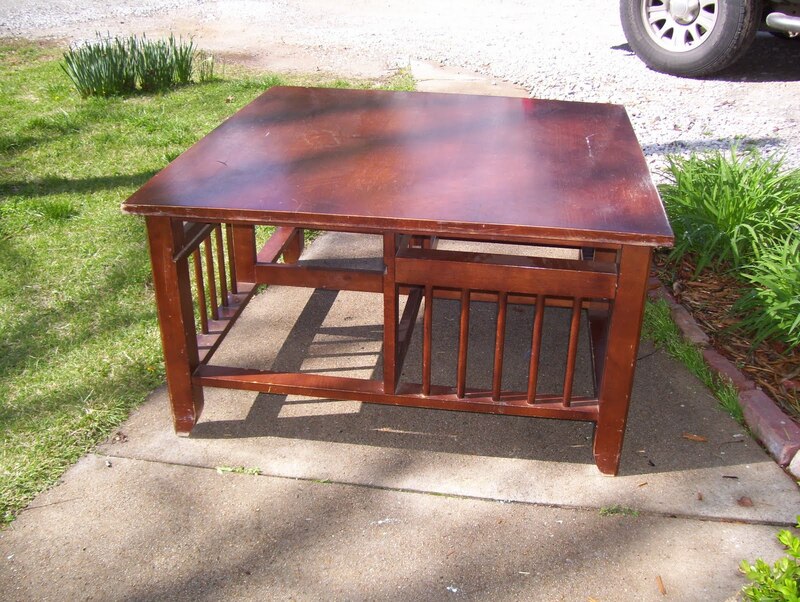 I didn't care for the mission style design under the top so I took out my trusty hammer and proceeded to bang the poor table to death until I had removed the pieces I didn't want. After every last piece was removed, I spackled up some holes and made a few minor repairs (got a little crazy with the hammer). 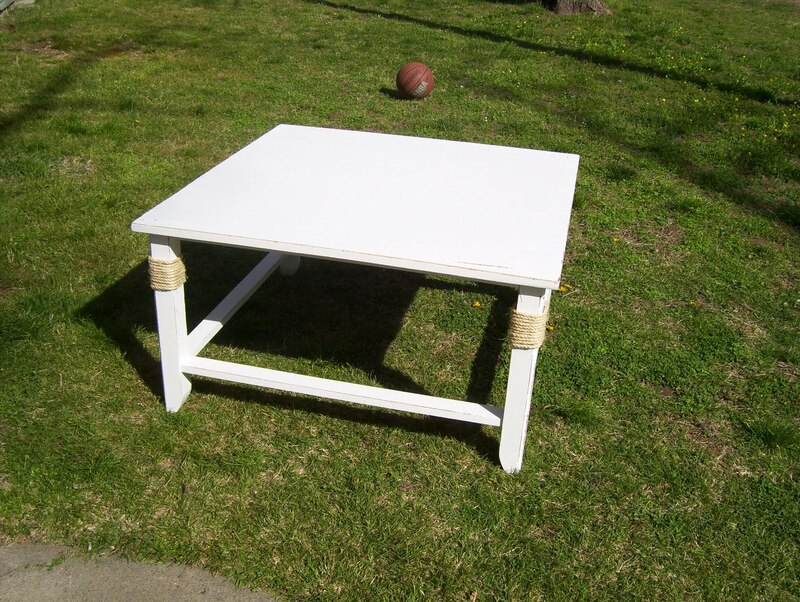 I then gave it two coats of primer and two coats of bright summer white paint. 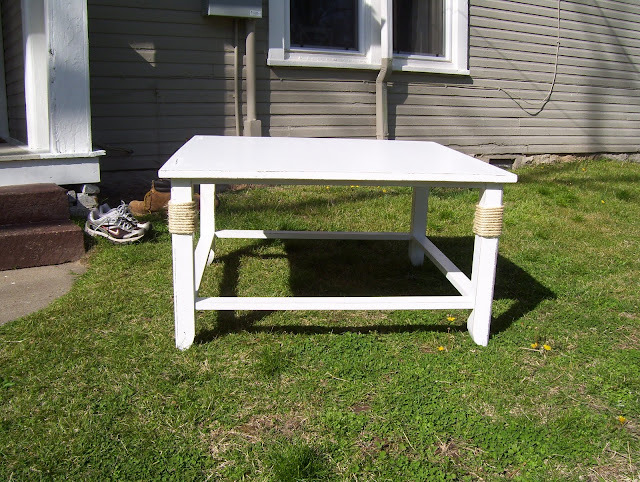 I wanted the table to have a beachy appearance to it so I grabbed some jute rope that I already had and wrapped each leg at the top and secured with hot glue. Then I took some sandpaper and distressed the edges to give it a little charm. I think it turned out great and for only $25! Can't beat that! 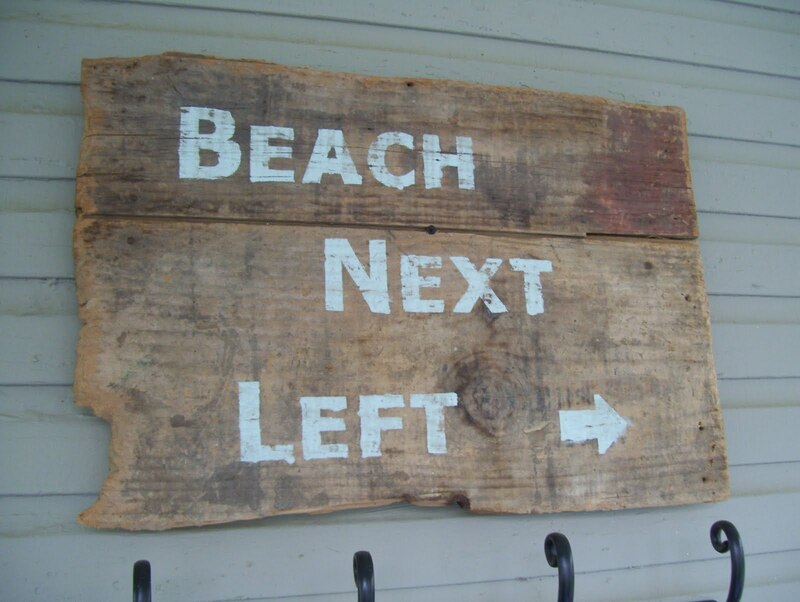 The only problem now is that I like it so much, I want to put it in my house instead of on the front porch! 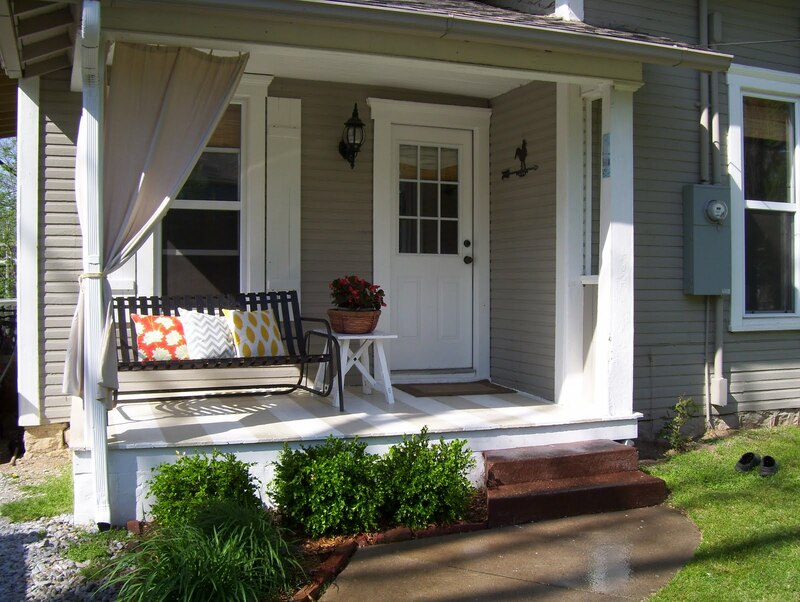 Hopefully the weather will cooperate with me this week and I will be able to finish my front porch makeover and post pics soon. Here are a couple pics of the finished table. 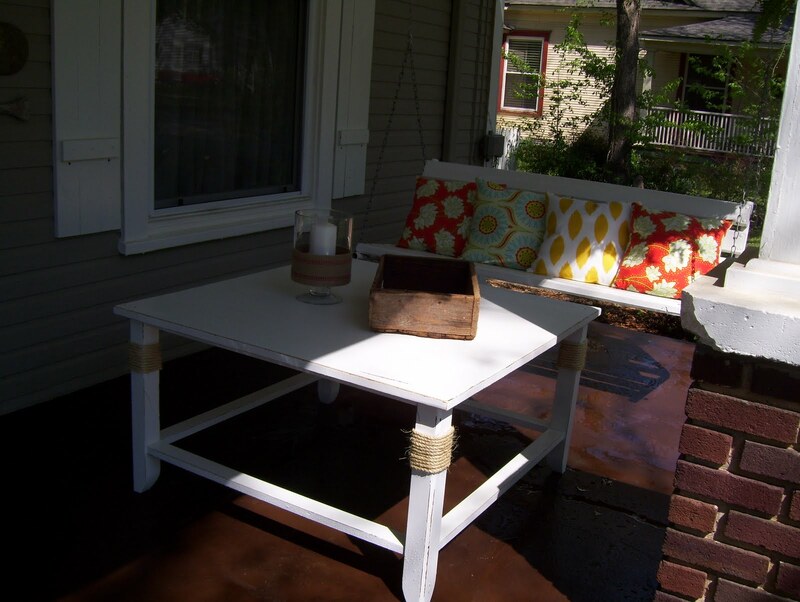 Here is the finished table on my newly refinished front porch! So fun! Have a great day everyone! Linking up with Thrifty Decor Chick today! Come join the Goodwill Before and After party!